But where has art led us? To a time before the world, before the beginning. It has cast us out of our power to begin and to end; it has turned us toward the outside where there is no intimacy, no place to rest. It has led us into the infinite migration of error. For we seek art's essence, and it lies where the nontrue admits of nothing essential. As part of a plan drawn by nostalgia and anxiety, I have been re-reading a few chosen books, wondering how might they re-present themselves to me after years of superficial memory and neglect. I have written about one I read in May. 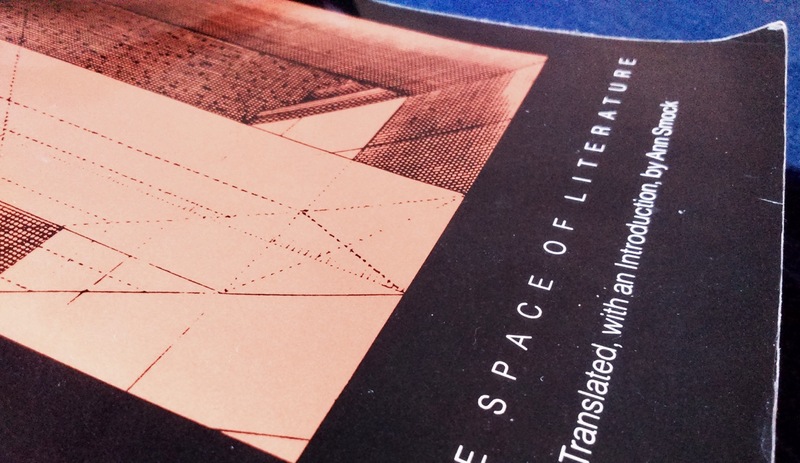 In June I re-read Blanchot's The Space of Literature (as translated by Ann Smock). The first few pages of the second felt like a chore blocking the discovery of new books – haven't I read this enough? – but I was soon reading each chapter as if it was I was returning home after decades of wandering. What I write now will be an attempt to understand and explain this reaction so won't be a comprehensive summary. The italics are quotations. The first thing to say is that 'criticism' isn't the right word for The Space of Literature, and, despite the many philosophical terms, allusions and adoptions, most notably from Heidegger, 'philosophy' isn't either. 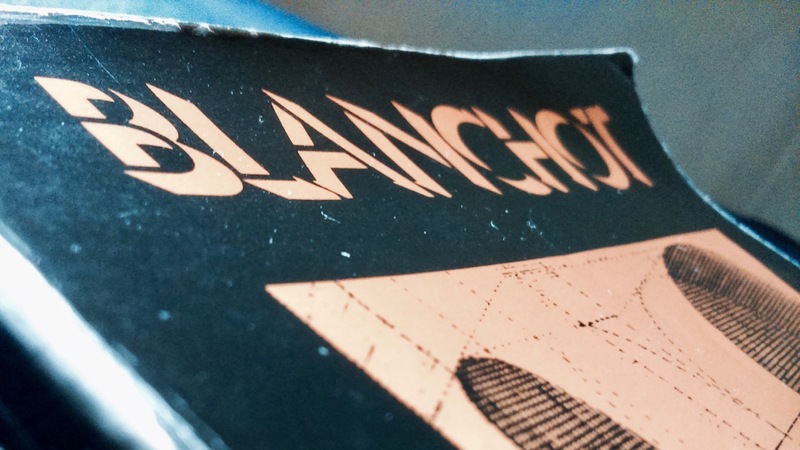 What sets Blanchot apart from any definable genre is that his writing exposes itself to its own analysis, or, rather, the analysis exposes itself to writing lacking such a possessive pronoun. The opening chapter asserts the 'solitude' of the written work: To write is to break the bond that unites the word with myself. The work is even separate from the book, which we might see as a vessel borne on the surface of a submarine current: Writing is the interminable, the incessant. This means that the space of the title is not a privileged realm for a few "great writers"; it does not have borders or features with rules to be learned but is at a remove from such power. Mallarmé felt the very disquieting symptoms caused by the sole act of writing. Blanchot cites Kafka's comment that he has entered literature when he replaces 'I' with 'He', but adds that this metamorphosis is more profound: In doing this, the writer belongs to a language which no one speaks, which is addressed to no one, which has no center, and which reveals nothing. Mastery over words puts the writer in contact with a fundamental passivity that cannot be grasped: To write is to make oneself the echo of what cannot cease speaking. Instead, in a stirring paradox, mastery consists in the power to stop writing, to interrupt what is being written. This a curious formulation. When we admire the tone of a particular writer, he says, it is not the writer's voice we admire but the intimacy of the silence he imposes on the word. He compares this to classicism in which the calm of the regular form guarantees a language free from idiosyncrasy, where impersonal generality speaks and secures the writer a relation with truth. But such calm requires the stability of an aristocratic society in which a part of society concentrates the whole within itself by isolating itself well above what sustains it. We might say that genre fiction is an aristocratic form. The imposition of silence is necessary because writing is an exposure to an outside – what might have been called the divine, the sublime or the infinite, and which Blanchot refers to the other night or the other of all worlds. And it is in incantatory prose and such hyperbolic phrases, otherwise unthinkable in literary criticism, that exposes us to how strange literature is in itself. Once you become accustomed to what at first appears as anachronistic and even absurd (certainly to English eyes – I remember a friend giggling as he read the opening pages), you might also recognise such excess defines us as human: in excess of body, in excess of world, akin to the internal perspective of language that Noam Chomsky has described and the excess of consciousness Mallarmé called this drop of nothingness. And if we are drawn to poetry and to the poets Blanchot writes about, it is their strange excess that sets their work apart and deserves to be addressed without being neutralised within the stability of a regular form. This is also why The Space of Literature appeared so vital to me upon re-reading; it does not stand aside from its subject. Reason … does not begin in the light of an evidency by which it would seize itself, but rather in an obscurity that itself is not manifest and whose discovery, seizure, and affirmation alone put thought to work, causing it to find and to extend its own light. It is then that Rimbaud flees into the desert from the responsibilities of the poetic decision. He buries his imagination and his glory. He says "adieu" to "the impossible" in the same way that Leonardo da Vinci does and almost in the same terms. He does not come back to the world; he takes refuge in it; and bit by bit his days, devoted henceforth to the aridity of gold, make a shelter for him of protective forgetfulness. In later life, Rimbaud is said to have denounced his past work, refusing any further mention of it, which, for Blanchot, "shows the terror which he still felt and the force of the upheaval which he could not undergo to the limit. He is reproached with having sold out and deserted, but the reproach is easy for those who have not run the risk". The bottomless abyss belongs to art. 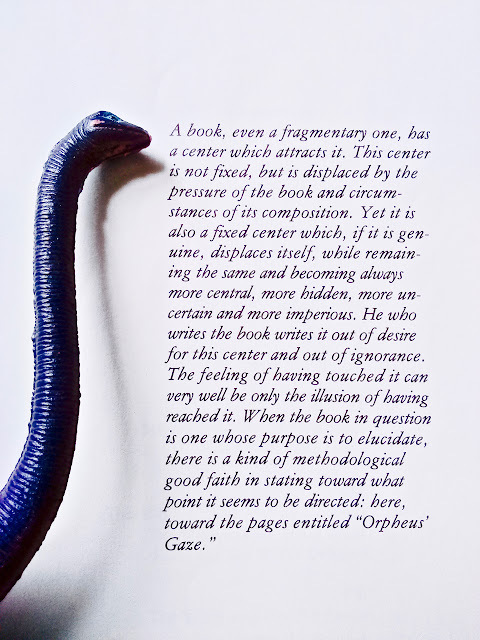 Re-reading The Space of Literature has reminded me why so much fiction leaves me confused by indifference and why criticism and reviewing often seems beside the point. While a novel's subject matter might be powerful and important, its story compelling, the prose style especially seductive and its sentences beautifully formed, such wealth often seems beside the point. The same goes for its social and political relevance, for a survey of its formal structures and for revelations provided by psychological analysis. They might seem very insightful and pressing, but essentially beside the point, which is itself unlocatable. But what other reasons can there be for reading a novel? Blanchot recognises how such a question is ironed out in book culture, with the general reader who makes a livelihood in a world where the clear daytime truth is a necessity [and] believes that the work holds the moment of truth within it constantly translating the work into ordinary language, effective formulae, useful values while, on the other hand, the dilettante and the critic devote themselves to the 'beauties' of the work, to its aesthetic value. Everyone, it seems, is happy. And with the advent of the internet, these groups have become indistinguishable. Witness the routine use of the word 'experimental' to champion, mitigate or patronise anything that doesn't quite meet either process, without any question of what 'experimental' might mean in in the first place. In the night, everything has disappeared. This is the first night. Here absence approaches – silence, repose, night. Here ... the sleeper does not know he sleeps, and he who dies goes to meet real dying. Here language completes and fulfills itself in the silent profundity which vouches for it as its meaning. This is not a negative however, as it is where craft and determination gets the writer through the night in order to produce books. We can recognise how night maintains itself in the popularity of, for example, Horror or Gothic fantasy, in which we are exposed to the darkness in human life and to the black-hole of a non-human world. Except, we all know it is only the thrill of a fairground ghost train. It is in this context that Blanchot divides night in two: When everything has disappeared in the night, 'everything has disappeared' appears. This is the other night. We enter into the night and we rest there, sleeping and dying. But the other night does not welcome, does not open. In it one is still outside. It does not close either; it is not the great Castle, near but unapproachable, impenetrable because the door is guarded. Night is inaccessible because to have access to it is to accede to the outside, to remain outside the night and to lose forever the possibility of emerging from it. Blanchot's essay on Beckett's trilogy is the most famous expression of this condition. Not even the best creative writing course can help. This might be why indifference stands before me and devouring novel after novel. Many might be impressively wrested from night but they are also recognisably resistant to the other; even the latest 'experimental' hit reaches for the same gifts of silent profundity. Despite this, I am still drawn to novels, many of which are not in the least avant garde, as my enthusiasm for In a Hotel Garden demonstrates. So what is going on there; have I fallen for sentimentality? My response would be that this also shows how novels might dwell in what Blanchot calls the torn intimacy of an alliance between the activity of book making and the passivity of writing, as the characters seek to bring to life what haunts them and yet do so only in the dissimulation of speech and stories. And not only the characters. The work was once the language of the gods, their absence’s speech; subsequently it was the just, the balanced language of men, and then the language of men in their diversity. Then again it was the language of disinherited men, of those who do not speak. And then it was the language of what does not speak in men, of the secret, of despair or ravishment. What, he asks, does such a list tell us? Only this: that art is constantly invisible to us. What is invisible demands to be seen, and if this suggests a demand separate from literary criticism, it is entirely in keeping with our times, in which origins are strictly taboo. What is left now for the work to say? What has always eluded its language? Blanchot asks. Seventy years after its publication, the answer and challenge proposed by The Space of Literature remains: Itself.